Collect both Nd3d and Nd4d regions to aid data interpretation. Very strong overlap of Nd3d with O KLL peaks. Use Nd4d instead (120eV), but this can also overlap with Al2s. Neodymium is a rare reactive earth metal with a bright, silvery metallic luster that quickly tarnishes in air. It was discovered in 1885 by Austrian chemist Baron Carl Auer von Welbach, who separated the metal from didymium with repeated fractionations. While the free element is in misch metal, long known and used as a pyrophoric alloy for light flints, the element was not isolated in pure form until 1925. 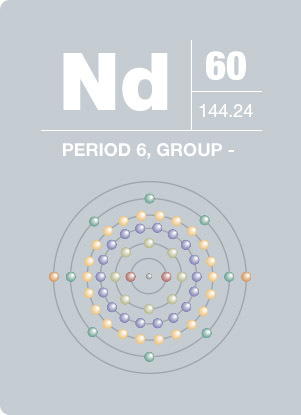 Neodymium is used to create strong permanent magnets used in loudspeaker and computer data storage devices. It is also used to color glass used in lasers and incandescent light bulbs.